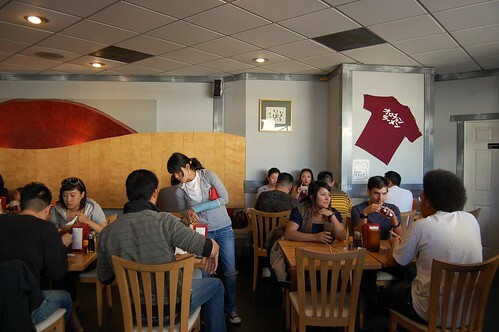 Have you ever gone to a restaurant where eating a certain food was a feat of strength? Like, if you conquered the meal, you'd get your name on the wall? Orochon is one of those places. 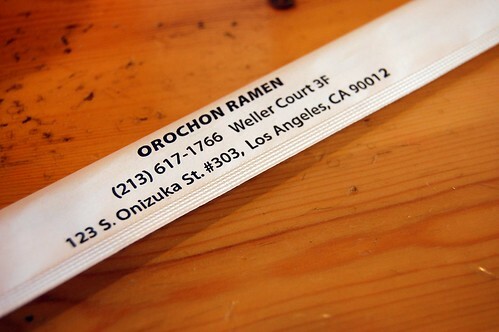 It's strange because Orochon serves ramen. 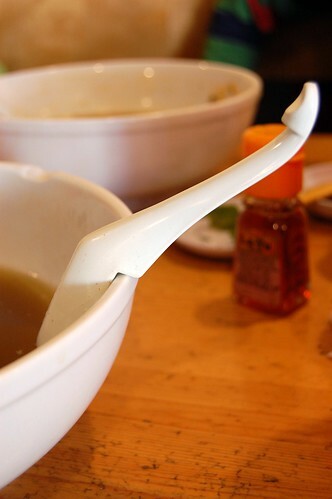 How hard can eating ramen be? These people all look pretty comfortable. Aside from offering three different types of broth -- miso ($7.25); shoyu, i.e., soy sauce ($6.75); and shio, i.e., salt ($6.75) -- Orochon gives its patrons the choice of an initial seven levels of spice, from "non-spicy" at Level 7 to "extreme" at Level 1. But, beyond these seven levels, there are the Special 1 and Special 2. 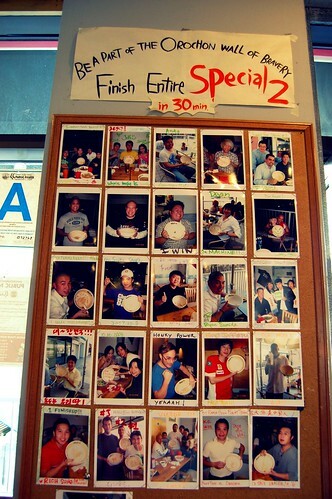 If you finish a Special 2 in 30 minutes, you become a part of the Orochon Wall of Bravery. Not even Mr. Monkey (a.k.a. The Master of Hot) felt up to the challenge, though. Because, really, who wants an erupting poocano afterward? Not us. First, I present our non-ramen dishes. 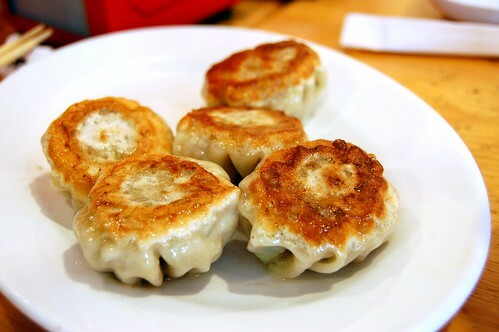 Pan-fried dumplings ($3.50). Crisp on the outside. Juicy on the inside. Good. 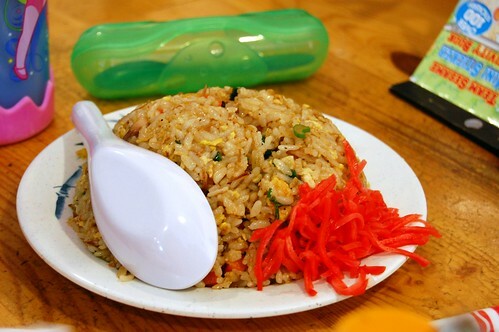 Half fried rice ($3.50). I didn't have any. 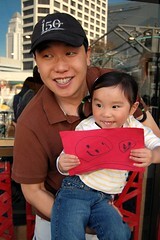 This was Little Monkey Niece's treat. Cha-su plate ($6.50). I didn't have any. This was my father-in-law's treat. 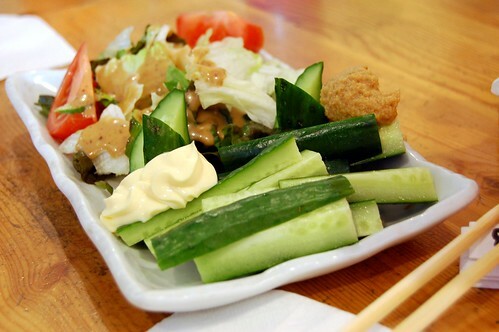 Cucumber with miso ($3.95). Refreshing, but nothing too exciting. 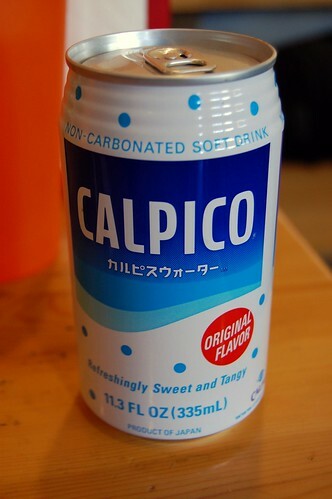 Calpico ($2.25). It's the perfect drink to cool your mouth during your spicy ramen. 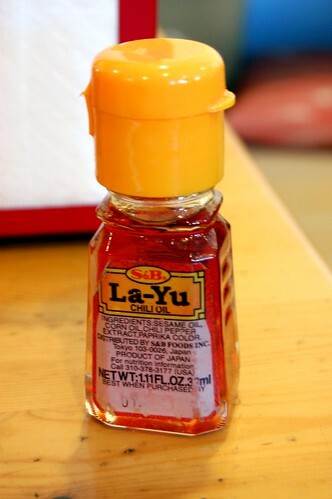 La-Yu. More spice for your meal. Good with dumplings. 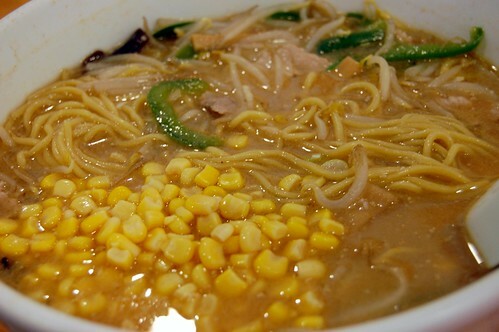 This is my shio ramen, Level 5, with cha-su ($1.25) and corn ($0.99). I got a fairly mild spice level because flavors are more pronounced in shio broth. 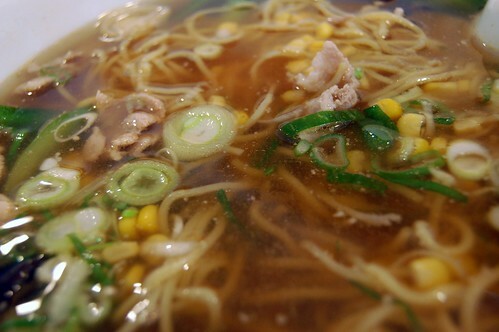 The shio broth was strong and delicious, but the noodles weren't as good and bouncy as those at Shin-Sen Gumi or Daikokuya. Mr. Monkey opted for miso ramen, Level 3, with cha-su ($1.25), corn ($0.99), egg ($0.99), bean sprouts ($0.50), garlic ($0.50), and extra noodles ($1.50). It wasn't as spicy as I thought it would be, as miso really tempers the spice. 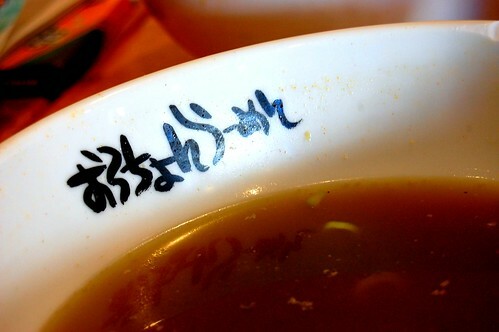 Thus, my advice to anybody who wants to be memorialized on the Wall of Bravery is to get the miso broth to cheat a bit. 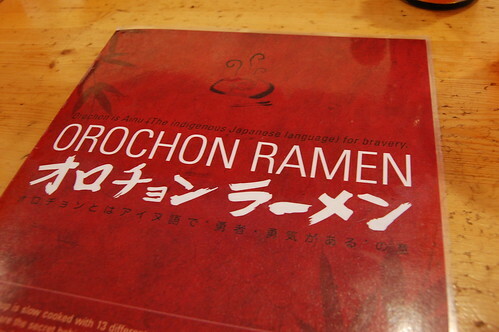 Orochon isn't my favorite ramen place, but it's good enough. I'd go back. 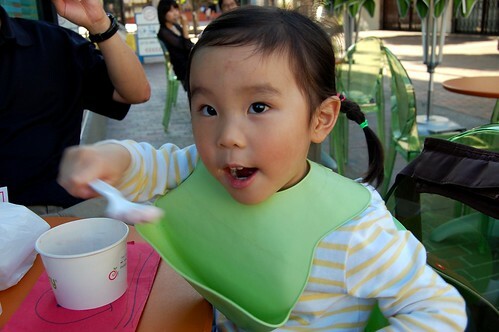 LMN wanted yogurt, so we took a short walk. 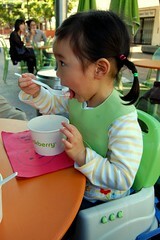 You're never too young to begin obsessing over pinkberry. 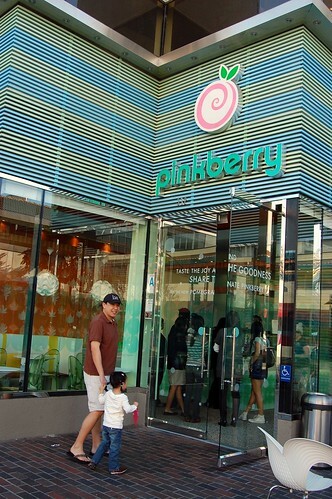 I completely burst out laughing at "erupting poocano"
I love the photo of the Pinkberry. Yum. 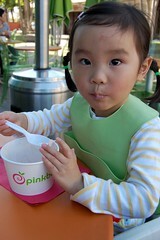 LMN totally color coordinates with Pinkberry. Future fashonista. 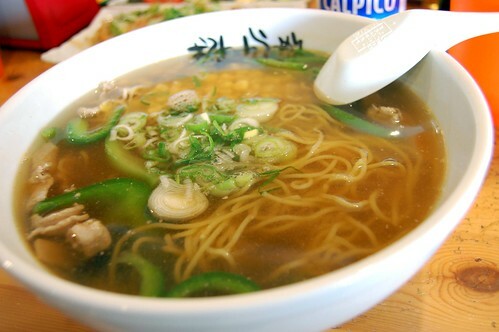 Hubby and I are drooling and now trying to remember all of our favorite ramen shops in Tokyo! Cucumber and miso is my favorite snack. As much as I appreciate your literary prowess,wit and style, I can no longer allow myself the pleasure of viewing your mouth-watering-makes-me-want-to-lick-the-screen quality food pictures. I am on week two of a very succesful fitness/weight-loss plan where refined carbs and sugars are against my religion. I should know better than to read your blog late at night. It's past 10pm and now I'm craving dumplings. And there are no dumplings to be had in suburbia. ramen could be the death of me. maybe i should take the bear there. neither of us are too afraid of the poocano if it tastes good going down. Yum! (Except for Mr. Mo's corny soup. Blech! My husband would be up on that wall. He lives for spicy challenge. He ordered his wings so spicy at a restaurant a few months back the waitstaff came to watch him eat them. They hurt just as badly coming out, I'm told. poocano would indeed be a bad thing. 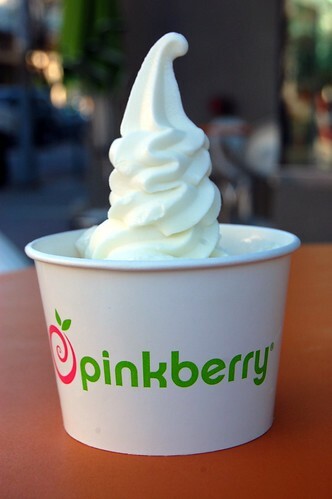 ramen + froyo = perfect meal. i wanted to eat everything until the poocano. that's gonna be my new way to stick to my diet. think poocano, stop eating. 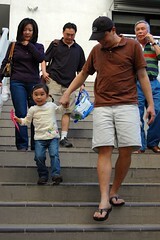 LMN is adorable with her pigtails! i am with you on level 5. mr. monkey's level 3 looks scary. 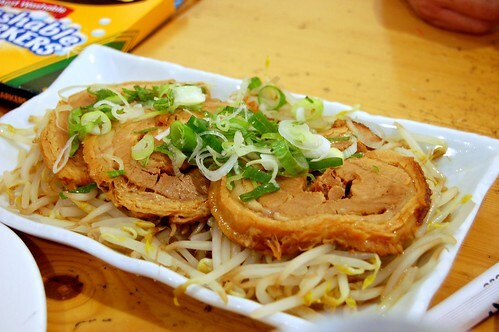 this is on our list to try for lunch soon. i like the idea of the miso broth. oh, and those pan fried dumplings look scrumptious! Stop Saying "That's So Gay"